You wouldn’t have recognized Hummelstown back in 1924 when Ciriaco Verdelli started farming most of the east end of town. In terms of today, his 80 acres of leased land ran from Cameron Avenue down Second Street to Chick’s, from Main Street, across Second Street, over the railroad tracks, through Kokomo and down to the Swatara Creek. That was Verdelli Farms. processors of salads, vegetables and fruit snacks on the East Coast. Ciriaco bought the land in 1943 and, as the business grew, so did the Verdelli Farms plant in Hummelstown, cooler by cooler. In 1993, when there was no more room to expand, the processing plant moved to Swatara Township. But Verdelli Farms’ heart and soul lingers in Hummelstown, where the old processing plant and stone farmhouse, badly deteriorated but full of stories, await demolition this winter. “We’re sad to see the buildings removed, but we’re anxious to see this part of town bustle again like it did 50 years ago,” said Lou Verdelli, Ciriaco’s great grandson. “It was an economic engine for Hummelstown and provided employment for hundreds,” Lou Verdelli said. two-bedroom apartments and provide living space for 300 new town residents. His father, Lou Verdelli Sr., and optometrist until he retired in 2011, grew up in the old buildings. He also fed chickens and plowed the fields. Later, when he became an optometrist, he returned to the farm on his days off. 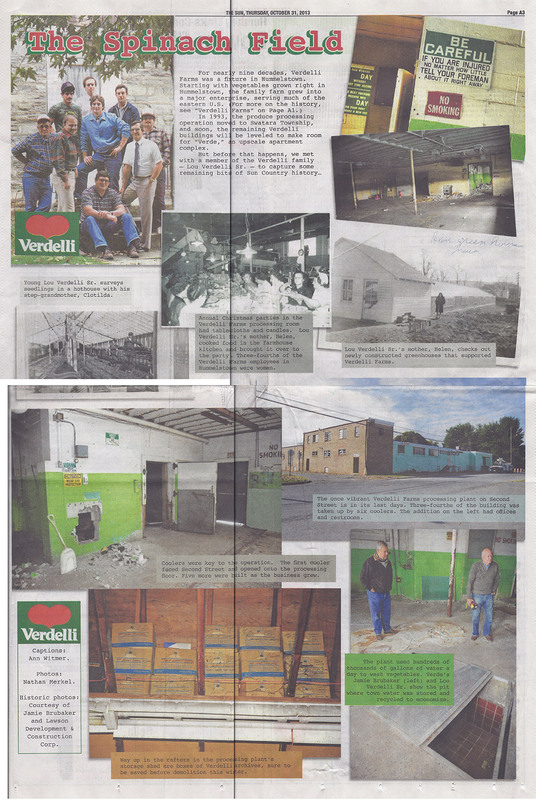 On a walk through the old buildings last week, Verdelli described what once went on there. He pointed to heavy round metal discs covering pits down under the floor. a food truck that pulled up to the building. Once the vegetables were bagged, they were taken to loading docks on Laurel Alley and hauled to supermarkets. Florida, and spinach from Colorado. Spinach was the staple. for a different variety of spinach – Bloomsdale, Malabar, Olympia and Savoy. Before trucks delivered vegetables, they arrived by rail at the train station near the National Hotel, now the Hummelstown library. clinging to them and we’d have to chop it off. It was c-o-l-d. Sometimes we had to do this in the snow,” Verdelli said. As we walked through the old plant’s six coolers, Verdelli told me they were built one by one as business grew, a curious parallel with how Verde’s developers plant to erect new buildings as their business grows and more apartments are needed. The old cooler walls are aged and crumbling but still insulated, as they were back then, with block of cork dipped in tar. Heavy metal doors slide on old wooden frames. Brubaker hopes to use one of them in Verde’s fitness center. Still stacked way up in the rafters of a storage area near the back, cartons of Verdelli archives will certainly be retrieved before the wrecking ball arrives. But yards of coal cinders dredged from the Swatara Creek as the base for the concrete floor will live on in legend only. Verdelli and his Uncle Albert finished that concrete floor. “It ruined my knees, but I still have them,” Verdelli said. Many of the old Verdelli buildings are already gone, including a barn and hothouses where plants were raised form seed. But the 1913 stone farmhouse adjacent to the processing plant still stands. Verdelli lived there for his first 13 years. Christmas was occasion for a festive party in the processing plant, with tablecloths and candles. “Mom cooked ham and turkey in our kitchen and brought it over to the plant,” Verdelli recalled. In the beginning, the plant had eight to 10 employees. At its peak, before moving to Swatara Township, Verdelli Farms employed 200. In 2007, the company was sold to Fresh Express, a subsidiary of Chiquita Brands International. Ciriaco Verdelli was part of Hummelstown until the day he died. “One day, when he was 78, he brought the mail back to the plant and died. His meal was waiting for him at the East End.” Verde’s developers also plan to be an integral part of town.